Curated For The Cool Kids. Our merchandise generally runs true to size, however fit is based upon personal preference. For example, our denim is a very slim fit and for a more relaxed fit we recommend sizing up. The "T" in 1T - 8T stands for Toddler Sizing. There is overlap between the size ranges mainly because all children come in different shapes and sizes and do not grow the same. 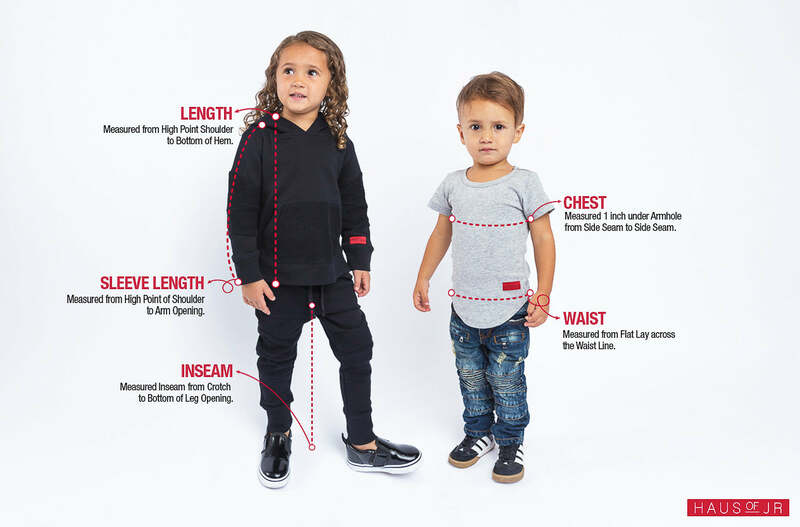 For example, a "4" in little kids sizing is going to fit slimmer than a 4T and a 2T is going to fit slimmer than a 24 months in baby/infant sizing. The silhouette for 24-month sizes is rounder and usually ideal for a baby of any age who might still be crawling, while size 2T clothes are intended for early walkers. The silhouette is less round and more upright to allow for easier movement as your little toddler starts to really get around. Returns, refunds and cancellations are not currently allowed for online purchases; only exchanges and store credit. All exchanges must be authorized by us before sending the merchandise back. Simply contact our customer support team by emailing support@hausofjr.com within 14 days of the order's delivery date. Merchandise marked as final sale cannot be exchanged. The merchandise must not be worn, altered or washed. The merchandise must be returned in its original condition, in its original packaging and accompanied by its original tags. After receiving the merchandise, we require up to 5 business days to process the exchange. We will notify you via email once your exchange has been processed. Please Note: Merchandise returned damaged or without authorization may be rejected and sent back to the customer at the discretion of HAUS OF JR. Original shipping fees are not refundable, however a shipping label will be provided for domestic orders to return the merchandise. Only one prepaid shipping label will be provided per domestic order. We do not accept international exchanges. We apologize for any inconvenience this may have caused. During our Cyber Sale and Heatwave Sale, we are not offering the free shipping over $100 promotion. We apologize for any inconvenience this may have caused. Because all children come in different shapes and sizes, we are unable to recommend a specific size. Our merchandise generally runs true to size, however fit is based upon personal preference. For example, our denim is slim fit, and for a more relaxed fit we recommend sizing up. You will receive an email confirmation to the email address you entered on your order. If you have not received an email confirmation, please check your spam folder. If you have not received an email confirmation, then the order has not gone through or you did not enter your email address correctly. Please contact support@hausofjr.com. Was I charged more than once? What you are seeing on your bank account is an authorization (a common bank practice handling credit card transactions to ensure sufficient funds and account authenticity). Depending on your bank, pending authorizations on your account will clear within 3 - 7 business days. If you need help speeding up the process, you can contact the issuing bank of your credit card. *Please only click the "Place Order" button once to avoid multiple authorizations. Why won't my discount/credit code work? Please be sure your code is entered correctly and applied before submitting your order. All promotions and/or codes cannot be applied after the transaction is complete. Promotional codes do expire; please be sure to look at the terms and conditions of the discount code to make sure the offer is still valid. Unique credit codes do not expire; If you have received a unique code from us, please keep in mind it can only be used once and cannot be combined with another promotion or be applied to shipping costs. Do you restock your inventory? Unfortunately, we are unable to provide restock dates at this time. Please follow us on Instagram @hausofjr for any future restock and/or release dates! Please send an email to support@hausofjr.com. Cancellations are not currently allowed for online purchases. Please only click the "Place Order" button once to avoid multiple purchases. How can I change something on my order? Assuming the desired change is applicable, please contact support@hausofjr.com immediately. Once our warehouse has processed your order, we will be unable to make any changes. Fulfillment times may vary due to availability of merchandise. Please note to allow up to 5 business days for order processing and verification. How can I get sponsored by Haus of JR? Since we are a growing company, it would be unfeasible to sponsor everyone. Thank you for your understanding. How can I become a model for Haus of JR? Models are acquired exclusively by referral from music artists, athletes and employees that we currently work with. Catalogs are currently distributed to only retailers that have active accounts. No catalogs are distributed to consumers. Please email support@hausofjr.com with any questions regarding your order. Please keep in mind that our online customer service hours are on business days from 9:00 am to 5:00 pm PST. Copyright © 2019 Haus of JR. All Rights Reserved.